Outside the rain is pouring, reminding me of a certain ephemeral pool which exist only during the wetter time of year. 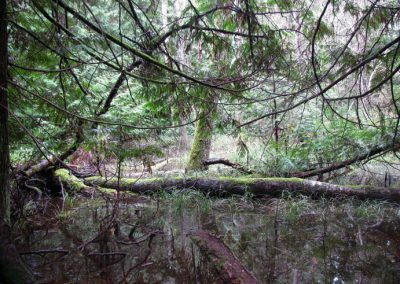 Surrounded by cedar, this seasonal wetland lies beneath the canopy of a grove of trembling aspen, climaxed in the midst of an old-growth woodland on a bluff above the Trincomali Channel. Here is a zone of stark contrast with the surrounding dry rock outcrop—a basin formed of clay which provides habitat for a unique assemblage of water-loving species. Every year in winter months the basin fills up with rain, forming a pool which rises and falls intermittently until it disappears in the spring. This place presented a mystery when we first came upon it, which continues to unfold through the research of a team of scientists at Utah State University. I recall exploring the area some years ago during the rainy month of February. 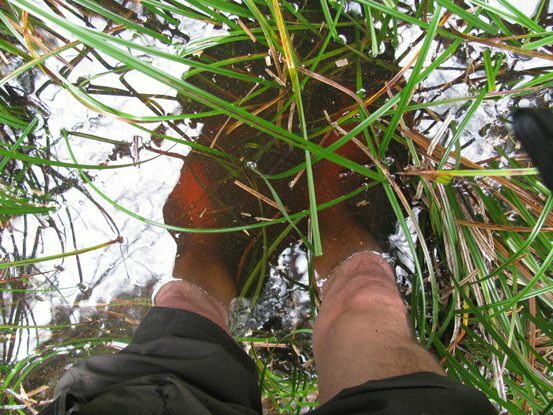 Up to my knees in cold water, I waded about in search of photo opportunities with some of the interesting species adapted to this seasonally inundated grove. At the time I knew of only a few places where the lungwort lichen (Lobaria pulmonaria) was established on Galiano Island. 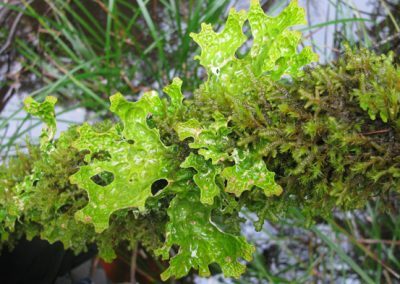 Yet here it was in great abundance, thriving alongside various liverworts and mosses—all benefiting from the rich alkaline environment supported by the aspen, whose roots draw up nutrients from the earth to be dispersed through bark and leaf. Some folks refer to such places as vernal pools: temporary pools of water which provide habitat to a unique array of species. 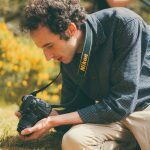 However, the botanist Curtis Björk thinks that term should be reserved for ephemeral habitats supporting a distinct community type. His alternative for our aspen grove?—A “sylvan pool”—a term which I rather like, as it refers to the forested character of this environment. Whatever you want to call them, such places are always interesting. Yet this sylvan pool had further mysteries to reveal. Looking up at the canopy in the wintertime, one wouldn’t immediately think they were standing beneath the boughs of quaking aspen (Populus tremuloides) for the lack of trembling leaves. Indeed the bark of these trees is so deeply fissured, not unlike that of our native black cottonwood (Populus trichocarpa), that even during the summer, when we initially surveyed this place, we had been deceived. It wasn’t until we later revisited the grove, and scanning the ground noted the peculiar shape of the leaves, that our eyes were opened to the puzzle that stood before us. At first we thought it might be the eastern cottonwood (Populus deltoides) because of the vaguely deltoid shape of the leaves; then we supposed it might be a hybrid poplar species known to be cultivated in certain forestry plantations. Yet when I brought in a specimen to show Dr. Quentin Cronk at UBC, who specializes in the Willow family (Salicaceae) to which this plant belongs, we determined that it must be aspen—perhaps the putative coastal variety Populus tremuloides var. vancouveriana. Because it is so rare on the coast, we never expected this species. And so we had been blind to it. Whether this “variety” of aspen is truly distinct, or whether it is merely an odd phenotypic expression of the aspen normally found in the interior, is a question that has yet to be resolved. And it might never be resolved, if not for the unremitting curiosity of human beings! Indeed the question of our aspen’s provenance was not something that would soon be forgotten, for elsewhere in western North America there are other groves of coastal aspen, disjunctive from interior populations, which continue to intrigue. 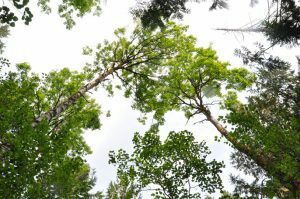 Some years after I reported the anomalous aspen grove to Dr. Cronk, a research team at Utah State University followed up asking whether I might be willing to collect a sample of the leaves of the Galiano population to be included in a genetic study. Any leaves would do, as in all likelihood they belong to the same organism because of the way aspen propagates itself clonally through an underground network of suckers. Happy to return to that wonderful grove—composed of the many trunks, boughs and branches of one great organism—I accepted the mission. And so in the autumn of 2016 a box of dried, pressed leaves left Vancouver Island by air mail, to be received by Dr. Karen Mock and her research team at Utah State University. Meanwhile, a small group of rare aspen enthusiasts await with great anticipation the results of her study.